Eurovision: where European nations compete through song, dance, costumes, pyrotechnics, and light shows every summer to an audience of over 200 million people worldwide-compared to the 30 million global viewers drawn to the 2016 Rio Olympic opening ceremonies (O’Connell 1). This summertime tradition has reflected not only Europe’s taste in music, but also language. Previous to 1999, countries generally sang in their mother tongues; then a rule change allowed them to choose any language for their entry (Rosell-Aguilar 2). 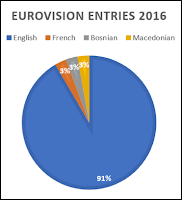 The effect of this change was seen almost immediately, both the percentage of entries and the percentage of winners who performed in English increased dramatically (Eurovision 1). The Eurovision Song Contest was created in 1956 by the European Broadcasting Union to mend and unify the continent after the previous two World Wars. Since then, Eurovision has been a reflection of political and cultural changes in Europe. Each country sends an entry of a song with at least one performer; the competition has grown to over 40 countries from the original seven in 1956 (Beauchamp 2). The competition promotes cultural diversity among European nations. The winning country hosts the competition the following year and displays their country’s culture in small video clips and skits as interludes to the acts. Following the 1999 rule change, countries can sing in any language including their mother tongue, any lingua franca, and even gibberish (Rosell-Aguilar 2). As well, the contest’s growing popularity and participation has brought in viewers from all around the world, prompting the inclusion of non-European countries like Australia to join in 2015 (Siim 1). This increase in participants correlates and arguably leads to the dominance of English as the chosen lyrical language and mimics the spread of English as a lingua franca in Europe over time. Looking at all the entries that made it to the semifinals or higher from the beginning of Eurovision in 1956 to 2016, there is a clear shift in the use of English starting at the turn of the century (Eurovision 1). 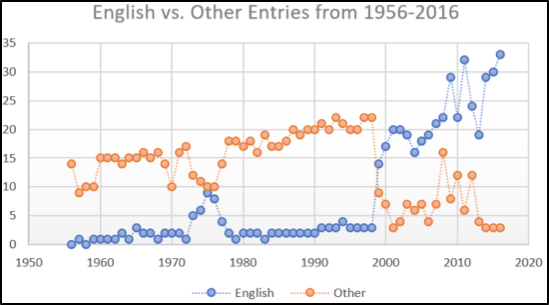 The breakdown of language used by contestants in the first year (1956), middle year (1986), and most recent year (2016) shows three stages of this gradual and eventual dominance by English. In 1956, 0% of the contestants sang in English; in 1986, 10% of the entries were in English; and in 2016, 91%of the countries chose to sing in English. The 199 rule change gave the countries the freedom to strategically choose which language to sing in, and most chose English (Rosell-Aguilar 2). Previous to the rule change, English shared the title of most popular winning language along with French. 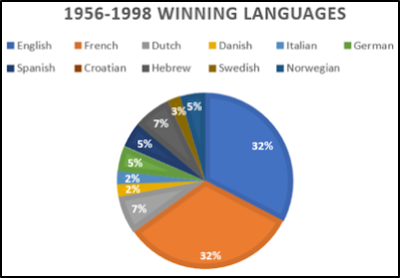 From 1956 to 1998, English and French won 14 times each, or about 32% of the time. The closest competition came from Dutch with just 7% of the winning entries. 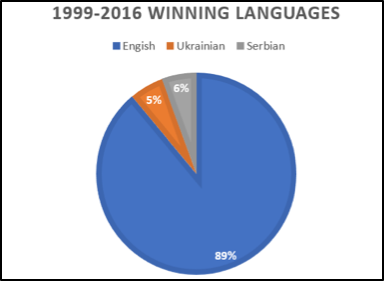 Following the rule change, English shot up to 89% of winning songs with Ukrainian and Serbian trailing it with one win, and 5%, each (Eurovision 1). 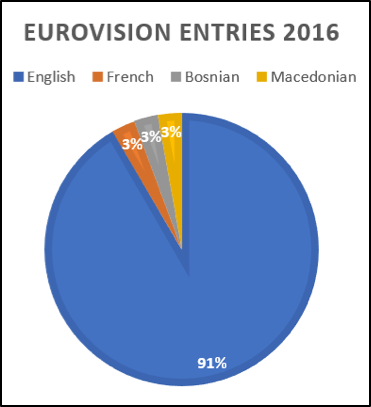 This dramatic change shows an undeniable trend: English, when given the option, will be the preferred language for Eurovision contestants and the preferred language for Eurovision voters and judges. Eurovision was created with the intention of bringing a war-torn Europe together, and now does so on a worldwide scale. Viewers pour in from around the world to bear witness to the over the top extravaganza that is Eurovision; last year totaling over 200 million. This increase in viewership, along with the 1999 rule change, have shifted the preferences to favor English over any other language. Beauchamp, Zack. "Eurovision, the World's Biggest and Best Singing Competition, Explained." Vox. Vox, 14 May 2016. Web. 08 Apr. 2017. <http://www.vox.com/2016/5/14/11667716/eurovision-song-contest-2016-logo-timberlake>. *Graphs produced by me by data gathered from:Eurovision. "History." Eurovision.tv. N.p., 14 May 2016. Web. 05 Apr. 2017. <http://www.eurovision.tv/page/history/year>. O'Connell, Michael. "TV Ratings: Rio Olympics Opening Ceremony Falls 28 Percent From London." The Hollywood Reporter. The Hollywood Reporter, 06 Aug. 2016. Web. 05 Apr. 2017. <http://www.hollywoodreporter.com/live-feed/tv-ratings-rio-olympics-opening-ceremony-how-many-watched-917393>. Rosell-Aguilar, Fernando. "Parlez-vous Eurovision?" OpenLearn. The Open University, 22 May 2015. Web. 09 Apr. 2017. 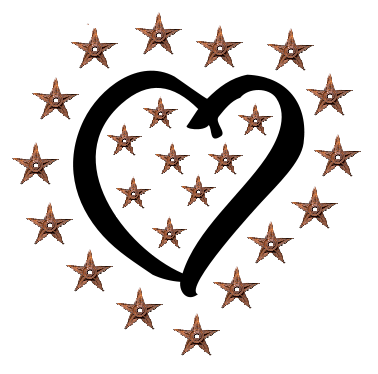 <http://www.open.edu/openlearn/languages/parlez-vous-eurovision#>. Siim, Jarmo. "Australia to Compete in the 2015 Eurovision Song Contest." Eurovision.tv. Eurovision, 10 Feb. 2015. Web. 06 Apr. 2017. <http://www.eurovision.tv/page/news?id=australia_to_participate_in_the_2015_eurovision_song_contest>. --------------Kirsten was a junior in Political Science at the University of Illinois when she wrote this blog post in the 418 ‘Language and Minorities in Europe’ course in the spring of 2017. She is currently applying to law schools to pursue a career in global corporate compliance.